The ultimate thrill ride is here. 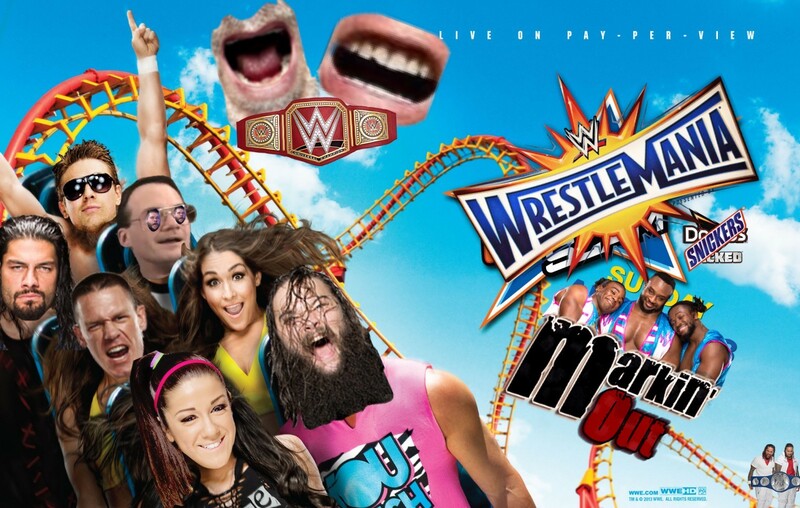 It’s WrestleMania! This entry was posted in Podcasts and tagged AJ Styles, Austin Aries, Bieber, Big Show, Booker T, Brandon, Breeze, Bret Hart, Brock Lesnar, Brooklyn, Brother, Bryan, Bullet Club, Buzzfeed, Cena, Cesaro, Champion, Chris, Cowboys, D-Von, Dallas, Daniel Bryan, December, Devon, Dolph Ziggler, Draft, Dudley, Dudley Boyz, Dudleyz, England, ESPN, Facebook, fall, Free, Game of Thrones, Hall Of Fame, HHH, Hitman, Hulk, Hulk Hogan, Hulkamania, Icon, Impact, Impact Live, Impact Wrestling, Independent Wrestling, Japan, John Cena, Justin Bieber, Kane, Kayfabe, Lesnar, Long Island, Lucha Libre, Madison Square Garden, March, Markin' Out, Marking Out, Mets, Mexico, MLB, Monday, MSG, Nakamura, New Japan Pro Wrestling, New Year, New York, New York Wrestling Connection, NJPW, NXT, NYWC, Paige, Phenomenal, podcast, PPV, Pro Wrestling Tees, Randy Orton, Raw, Recap, Regardless, Results, Ring Of Honor, ROH, Rollins, Roman Reigns, Ronda Rousey, Royal, Royal Rumble, Rumble, Rusev, Ryback, Ryder, Ryder Revolution, RyderMania, Seth Rollins, Shane McMahon, Sheamus, Shinsuke Nakamura, Spear, Sports Entertainment, Styles, Survivor Series, Takeover, Taylor Swift, Team 3D, Texas, TLC, TMZ, TNA, Total Nonstop Action, Tough Enough, Triple H, Twitter, Tyler Breeze, UFC, UK, Undertaker, USA, Vince McMahon, winter, World Wrestling Entertainment, WrestleMania, wrestling, WWE, WWE Network, WWE World Heavyweight Championship, WWE2k17, WWENXT, WWWYKI, Wyatt, Wyatt Family, Zack Ryder by Brandon. Bookmark the permalink.